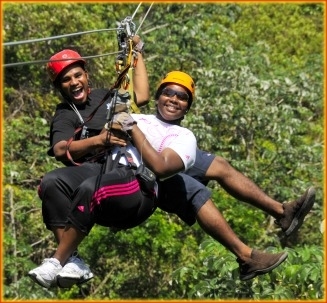 South Shore Canopy Zip Line Tour and Eco Park Adventures! Fast... Fun... Friendly... For the whole Family! 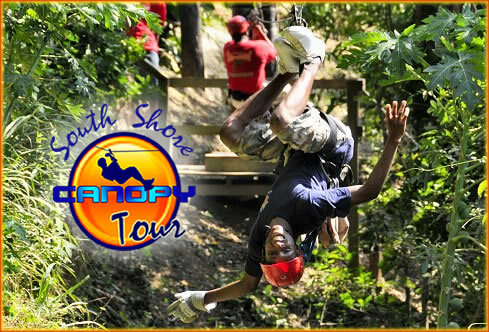 Join South Shore Canopy Tour for Roatan Zip Line Fun, Jungle Canopy Adventures and Amazing South Shore Views! 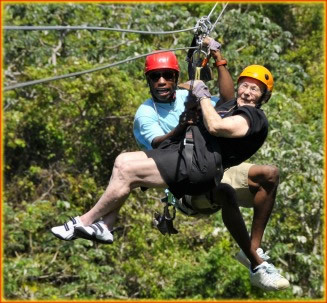 Zipline with full ACCT acredidation on Roatan Island. Be the first to enjoy our New Zuperman Zip Line Tour ! Picture yourself on a thrilling Roatan Zipline flying over tree tops and soaring through the tropical vegetation high above the forest floor! Our South Shore eco-friendly design offers a perfect mix of adventure and peaceful tranquility as you are suspended by cables creating a "bird" like effect similar to flying through the air with a birds eye view of the earth below! One of Roatan Islands most popular activities, our canopy tour is composed of 16 platforms and 11 steel suspension cables strung at various heights between the trees. They offer visitors a unique means of accessing the beautiful and remote areas of Roatan as well as breathtaking Caribbean views. 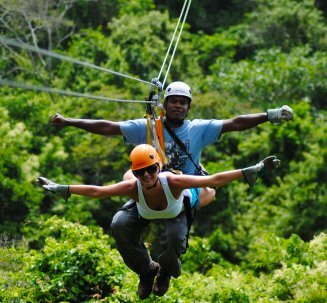 South Shore Canopy uses only the best safety approved gear and puts your safety first with highly trained and experienced staff as they personally assist you through the Roatan zip lines. South Shore's New Zuperman Zip Line Tours provides the Superman ride of a life time and is the only experience like it on Roatan. Their special harness let's you fly through the air just like a bird in complete safety. It's a blast!! 1500 toward the sea at incredible speed that is both thrilling and exhilarating! Click into the second zip line for a 1350 ft long spree. Once you catch your breath there is a a jungle bus to take you back to our lofty concession stand, shaded lookout post, gift shop and bathrooms. There are two zip stations so 2 people can fly at the same time! We provide a guide if you need one, or suite up and go solo! The harness is specially designed to fly in the Superman position with a weight limit of 250 lbs max and a 110 lb minimum. Check out our new Promotional Video! Tours and prices. Book Now! 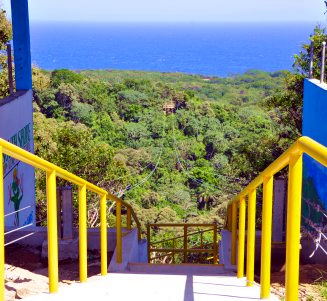 South Shore's Eco Walkways and 8 Suspension Bridges allow for nature enthusiasts to leisurely walk through the raw Jungle of Roatan Island, spotting Iguana, birds, lizards, amazing wild tropical blooms and interesting "Tarzan" vines (please no swinging off the bridge) ... a photographers dream world! There are concrete walkways, wooden steps and handrails. Each Roatan suspension bridge has a width of 4 feet and a capacity for 10 people and vary in length from 150 feet to 200 feet, making them the longest and strongest bridges in the Western Caribbean. This is the only tour of its kind on Roatan Island! The duration of the hike through the Walkway is about 30 - 45 min. depending on the stops you make. Guided tours and self guided tours can be booked in advance! Suggested Booking: Family of 4: 2 Zip line and 2 Eco Walk. Maybe Grandparents are along or someone with back issues and they just want to walk down and observe. All can ride back up together in the end! 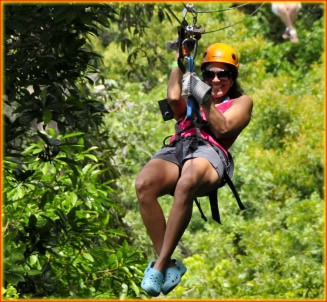 South Shore Canopy Tours is located on the South West tip of Roatan Island close to most tourist attractions, fun beaches, various restaurants and bars, and several resorts and luxury condominium properties. It is located just 5 minutes from West End and West Bay. If you are visiting us from the Cruise Ship we recommend that you purchase one of our Tour Packages at our cruise ship dock booths! 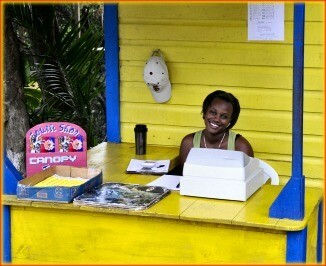 Our staff will be ready to greet you and get you started on your fun Roatan Zipline and Eco Walk through the jungle. 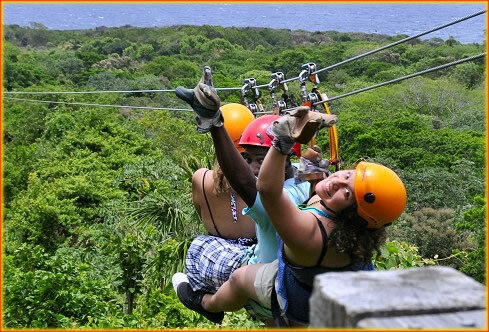 Our Roatan Zipline Tour and the Eco Walkways with 8 Suspension Bridges sits in 28 acres of lush Roatan tropical island vegetation filled with exotic wildlife and beautiful island palms, fruit and nut trees, and the famous Gumbalimba tree that sway softly as the Western Caribbean breezes flow. From the start on the Zip launch platform or Walkways, to the last swinging bridge, a new world will unfold as you glide through this natural ecosystem. 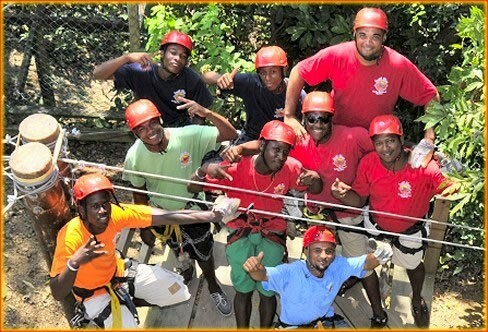 Join the thousands who have experienced the thrill of our South Shore Canopy and Eco Park Adventures along with our enthusiastic staff and add Miles of Smiles to your vacation destination! Make your reservation today! 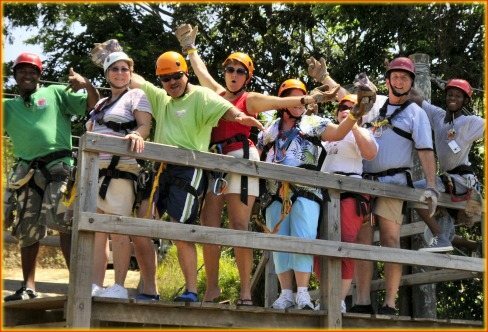 Info@SouthShoreZipLine.com 504 - 9967 - 1381 or 504 - 9521 - 5078 Add 011+ when calling from the U.S.A.
© 2010 Roatan.ws All Rights Reserved.